The overall education level in Story County is quite high, with only 14.9% of residents having a max of high school or equivalent level of education and 1.3% having less than high school education levels. Within the Ames community, there is a large percentage (~37%) of households that have an income of under $25,000 per year while the communities outside of Ames tend to have higher average incomes. The Unemployment rate within Story County is low at only 3% but there could be some improvement in the number of full time jobs. Within Ames, there is a large feeling that the community safety levels have largely stayed the same while outside communities feel that crime is getting a little worse. Among Story County residents, the perception of the social environment is that the communities are friendly and respectful with people willing to work for the community. 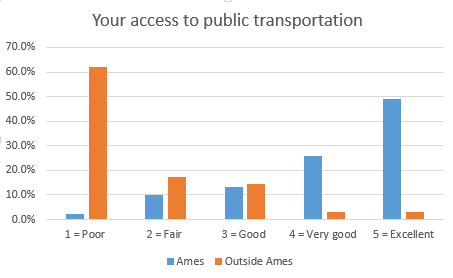 Public transportation is readily available and easy to access within Ames but outlying communities are under-served.